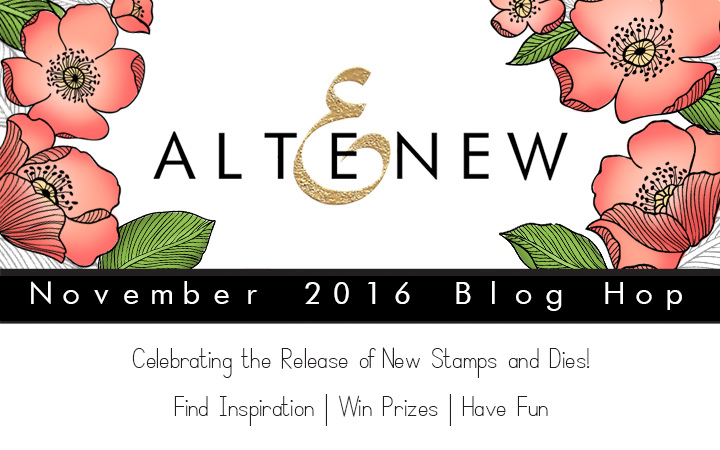 Hello and welcome to Altenew November 2016 release blog hop! You probably came from Sandy Allnock blog. If not – you may consider starting from the beginning at Altenew blog and see what other members of Altenew’s design team and guest designers have come up with (and also you have a chance to win a prize on each hop stop). I made two cards using supplies from the new release. The first card would be perfect for a person, who loves sewing and is made using Sew Very Happy stamp set. The idea of this card is a sewing project in process (let it be a patchwork). To make this card I first cut several paper “patches” of Classic Crest Solar White cardstock and made “fabric” with them. By clear embossing floral design and then inking with Dusk ink. I adhered all pieces onto a piece of thin paper, smaller in size. Next I pierced holes in each piece, using Tim Holtz ruler as a guide (it has holes 1/8 inch). Then all pieces were stitched together using red twine. I stamped several images from the set, colored them using COPICs and hand cut with my scissors. They were foam mounted the “patchwork” onto a top folding A2 card base made out of Pale Gray cardstock. Next the sentiment was embossed in the left bottom corner using red embossing powder. Finally I adhered all elements onto the card, some of them were adhered flat using liquid glue and some were foam mounted. The second card is made using new Vintage Teacup stamp set. I stamped the cup and saucer onto Classic Crest Solar White cardstock using Dusk and Desert Night inks, colored them using COPICs and cut out using coordinating dies. I stamped and die cut several vintage roses using Vintage Roses stamp and die sets. An top folding A2 card base was made out of Classic Crest Solar White cardstock. I inked the center of it using Ocean Waves ink and stamped the sentiment using Desert Night ink. The cup, saucer and roses were mounted in the middle and several sequins finished off the card. To celebrate this release, Altenew will draw three winners who will each receive a $50 gift certificate to their online store. Please leave a comment on the Altenew blog by Monday, November 21st 23:59pm EST for a chance to win. The winners will be announced on Tuesday, November 22nd. I will also randomly choose a winner from comments left on this post and the prize will be $30 gift certificate to Altenew online store. Please leave a comment on this post by Monday, November 21st 23:59pm EST for a chance to win. I will announce the winner here in this post on Tuesday, November 22nd. The winner of $30 Gift Certificate is carol . Congratulations! The next stop in the blog hop will be May Sukyong Park. If you got lost, please go back to Altenew Blog. Like these projects? I created a Pinterest-friendly pictures that give several views of cards. You can pin them and save for later. WOW! Beautiful cards I especially like the sewing card. Your card is amazingly beautiful!!!! Oh, my goodness., These are both simply yummy. I especially liked the sewing themed card. My mom, 92 last month, said for years that a day without sewing was a day wasted. I try to help her out by bringing her projects to sew. (Just trying to be a good daughter!) Thanks so much for bringing a smile to my face this morning. Pretty! I know my MIL would love the scissor card… she’s a quilter. Awesome ideas! What a great card for anyone who sees. Your teacup cards s beautiful. Your sewing card looks 3D! Your coloring is amazing! Love that sewing card! I’m not really in to sewing, but that’s one stamp set you don’t see a lot of so I’m sure those of you who love it love this set! Your tea cup card is cute as well. Thanks for sharing! Beautiful coloring! These would make great Mother’s Day cards! Your first card is so fun and unique; love it! added the flowers to the cup. Very pretty colors! Great cards and as always the altenew stamps are always my favorite. Lovely. The vintage tea cup stamp set is a must have for sure. The sewing and the tea cup are just amazing. Love your colouring. Your cards are stunning. I especially like the sewing card. Beautiful cards! I am a card maker and a seamstress, so I enjoyed seeing the sewing set card! These cards are gorgeous. I love the sewing stamp set. The way you did the teacup is awesome. Beautiful cards – how I love that tea cup stamp. Vintage tea cup, vintage sewing supplies – wonderful! WOW! Beautiful cards! You did an amazing job coloring! Beautiful cards, I don’t even sew and I want that card, it is so Beautiful, Love it. Your sewing card is pretty but the teacup card makes me want to happy dance! SO pretty! I love the flowers in and around the pretty blue cup! An amazing creation! TFS! Svetlana, Your cards a very cool, love the colors and layouts. Thank you so much for Haring with us. Really pretty! Thank you for sharing with us. You know, the sewing set was not on my list but after seeing your card…I want it! Both cards are beautiful but that sewing card is just awesome!!!!!! Loving what you did with the new stamp sets! Loving the Sew happy set! Your sewing card is simply beautiful! Both cards are beautiful, its nice to see the sewing designs. The sewing card says it all! The sewing card is awesome .This is a beautiful set! I love Follow your Dream , Vintage Teacups,and Adore You. They are my favorites. 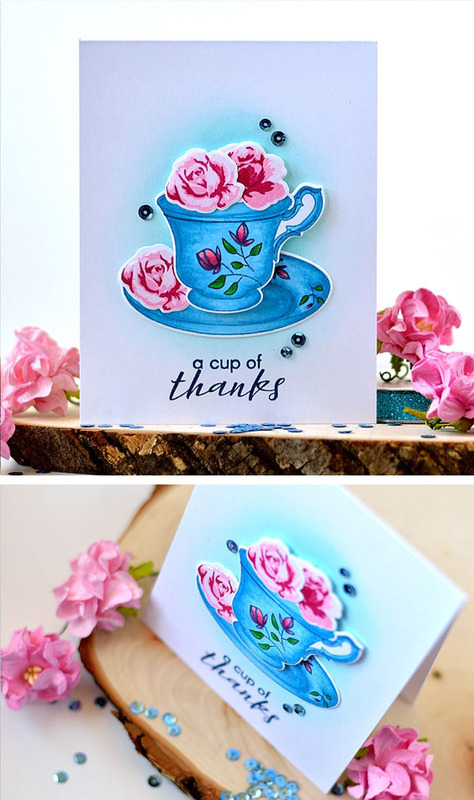 The Vintage Teacups card is gorgeous, Svitlana, but your Sew Very Happy card blew me away – the colouring on this card is amazing! In love with this sewing set. It is amazing. Thanks for using it in your hop stop. I love the colors you used and that wonderful pair of scissors. It is nice to see the sewing stamp made into such a lovely card. How lovely to see someone using the sewing set of stamps! Lovely card and your colouring of the images is spot on! Your vintage teacup is darling with its blossoms in it. Great work! Great cards. Love the sewing one. Just beautiful! Thank you so much for sharing. Love the tea cup set a lot. When you combine it with the vintage roses, it looks fabulous. Love your sewing card and you teacup is beautiful. Great work. Lovely cards. I like the coloring on the tea cup card and the stitching on the sewing themed card. Love both cards but you are the first one to use the sewing stamp set and I love what you did with it. Perfect set for quilter or seamstress. Two amazing cards. The quilt idea is so cool and I love the flower in the cup. The colors on both cards are fantastic! Fantastic cards. Thank you for sharing your ideas and techniques. Love the way to added the flowers in the teacups and your coloring is beautiful. Beautiful card. Such a unique way of showing the vintage tea cup set and the flower set. Love this. I like the blue and the pink of the vintage cup they make the card wonderful. I like the color combo. Beautiful card. Great cards! love all the dimensionality on the sewing card! Gorgeous cards, amazing copic coloring and love the sewn patches! The vintage teacup of vintage roses is oh so pretty too! These are really amazing….that blue color is gorgeous!!! Very clever idea to stitch the paper together like that for the sewing card and I am loving the flowers in the teacup. SUCH a great release! I love quilting but had to give it up because of my shoulder. Your sewing card is beautiful. My favorite is the tea cup. It is fantastic. Svitlana- these cards are so eye catching! I love the blues and little details you added. Wonderful. Both cards are beautiful! Great job! Love the tea cup! Beautifully done! I love combining the flowers and the teacups! They look great together! beautiful cards! the sewing card is really unique and beautiful! Your sewing card is just SEW clever! Great design! And I just love the simple beauty of your teacup and flower card, really VERY pretty! Love your sewing card, that is awesome! Your cards are superb ! I am happy someone used this new set on their card…..very cute! Wow! Very creative work. First time seeing your cards. Like what I see. TFS! fabulous cards. the patch work is so creative. love the tea cup card. I’m a fam of tea cups. Both cards are adorable. Great addition to the Altenew collection! Just beautiful! Must say that the more I see this Vintage tea cup set….I know I should own it….thank you so much for sharing your talent.. I really like ‘Sew Very Happy’ stamps set! I think it’s my fave! love these cards!!!! I love the stitching. Two gorgeous cards. I love the different style of each. I especially love that sewing card. It’s great to see this set “in action”. Your colouring is wonderful. Gorgeous cards! I love your beautiful coloring and details! Love that Sew Very Happy set and the way you used it on the card! As always, your cards are very beautiful! Your cards are beautiful!!! Love the colors! Great cards, and great use of colour. I especially like the cup and saucer. What Gorgeous cards and what wonderful stamp sets! I so love the tea cups and I’m in love with that sewing stamp set!!!!!! Might have to put those on my Santa list!!! Beautiful cards. I’ve added the Vintage Teacup set to my wish list. Fabulous cards! I particularly like the sewing card! Very lovely cards! Thank you for sharing your creativity!!! Beautiful patchwork and teacup cards! Lovely cards. Each time I see the Vintage Teacup set done in another way it inspires. Wonderful stamp sets, and wonderful creativity from you! Awesome cards! Love the vivid colors on the sewing card! I have a lot of friends that sew & can see I need this set. The tea cup card is just beautiful & that set is already at the top of my wish list! Beautiful cards. This is the first I am seeing the Sew Very Happy stamp set. I have a few seamstresses in my family that would totally love this card. The Vintage Teacups card is gorgeous with the blues and pinks. Great cards.love the color combo.release is so lovely. Love your cards. The “sewing card”. Is so cool. 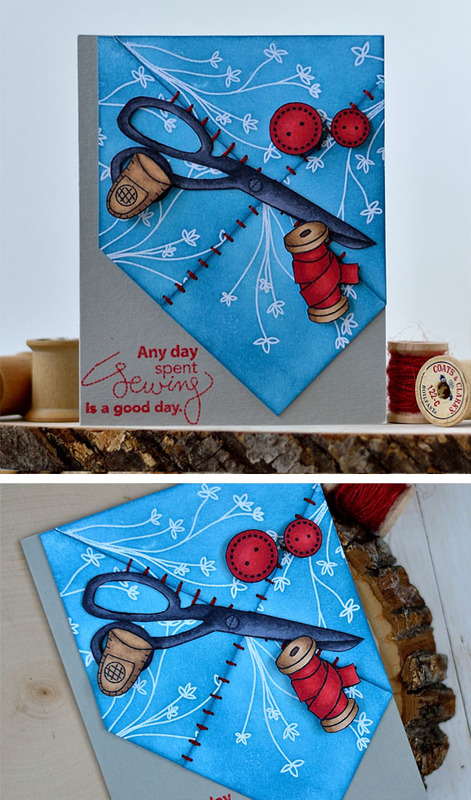 I just love love love the scissors on the card and the detail but it’s just a great card …way to go! Both cards are beautiful! Love the bold colors! Love both cards. The day spent sewing card is so inventive. love both of your cards, Svitlana but the teacup card is the absolute favorite!! So pretty!! Both cards are great but the sewing one is simply fantastic!Well done! So glad some one showed us the sewing stamp set. It’s so cute!! Your card is adorable. And of course we all love the tea cups and on that card, I love your coloring. Altenew has a great release for us! Beautiful cards. Love the pretty sewing card. Thank you! The flowers in the tea cup are too cute! Wow! Svitlana your cards are stunning!! Your coloring is so amazing!! The one with the quilt is so fun and unique ? Oh my my! Such lovely cards! Every artist on this blog hop has created such beautiful pieces of art. It’s so inspiring! I feel like there really is a piece of fabric on that “Sewing in Progress” card- great colors and truly creative interpretation of this new stamp set. Love the sewing card! So creative. Such vibrant cards. Love them!! Thanks for the two fun, happy cards. Love the vibrant colour in both cards! Your teacup card is so very pretty! First time I’ve seen the Sew Very Happy set used & I love how the blue looks like fabric! Fabulous cards Svitlana. Great design with the stitching on the sew happy card. Love your gorgeous teacup with the beautiful roses. That bit of shading behind the cup really sets the image off. you make sewing beautiful. . . and what a lovely cup of flowers. . .
Beautiful cards. Great new release. How creative! Love your card designs! Thank you for sharing! EXCELLENT! EXCELLENT! EXCELLENT! Both cards. My favorite is the patchwork card. I have friends who quilt and they would adore this card. The real stitching is awesome. I can just see them running their fingers over the stitching in amazement. Well done. Wow! You used the Sew Very Happy stamp set! I love your vibrant coloring on both cards. Great ideas. Thank you for sharing. This is the first card I’very seen using the sewing set. Ver creative design! How clever your stitching is! Really great cards. The sewing is really special. Wow!! Both cards are absolutely gorgeous!! Both of your cards are lovely but I really like the Sew Very Happy card. The sewing of the patchwork pieces on the card is very clever. Thanks for sharing. I love your sewing card, but the teacup is absolutely beautiful! OH MY… Both of your cards are absolutely beautiful!! Oh that gorgeous teacup full of flowers! Love how you got the design on the saucer, too! 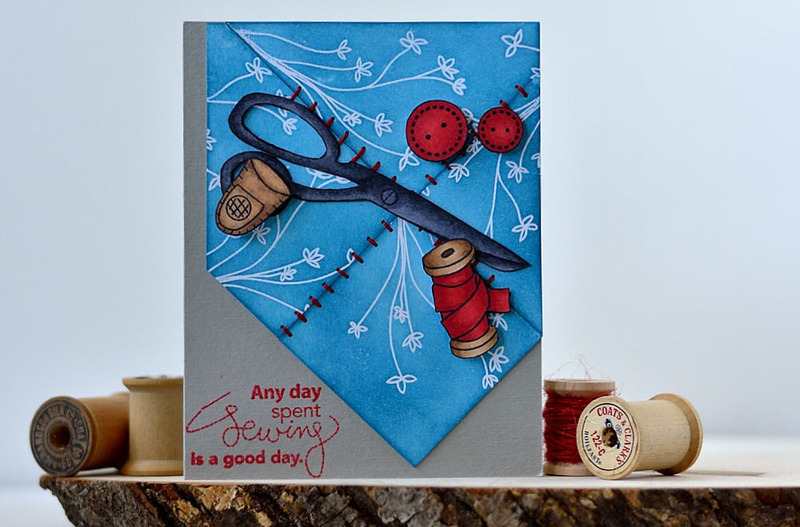 Great to see someone use the sewing stamp set and you’ve presented it beautifully, Svitlana. Very pretty and such great coloring!! Love your cards. Gorgeous cards! The highlight is your teacup card, as it sparks memories of my grandmother’s teacup collection. Three of her beautiful cups reside in my home, where they are treasured deeply. The ‘win’ for me: seeing your amazing creativity in action! Thank you! Sew pretty!! I love the shade of blue in both cards! So pretty! I especially love the teacup card. Thanks for this awesome inspiration! and will need this set. The flowers in the teacup are fantastic. beautiful cards. Love the shading on the teacup. Great job! The card you made with the sewing stamp set is adorable. Thanks so much for sharing! Your tea cup card is beautiful with the Vintage Flowers! Two absolutely fabulous cards Svetlana! Love the sewing card – amazing. Thanks for the inspiration and chance to win! Beautiful teacup card and adorable sewing card. “Sew beautiful” Svitlana! Both cards are amazing, great work! Love the flowers in the tea cup. Lovely cards Svitlana. The sew very happy card is so pretty. Love the ‘stitched’ pieces. The roses are so pretty in the tea cup. Wonderful coloring. The teacup is so pretty and the sewing card is truly adorable. Love them both! Love that quilted card! Such a great effect! WOW Svitlana ! Your cards are so wonderful ! I love your Sewing project, it is so creative and so well coloured ! And this tea cup card is a feast for the eyes ! I love the idea of filling it with flowers ! Very gorgeous combo colours for both of them ! Thanks for sharing. I love that blue color !! Your cards are beautiful! Gorgeous work! Love the cards and the blue is awesome! Lovely cards. I have a sister that is a quilter and that sewing set will be perfect for her. Thanks for the inspiration. Amazing cards. Love the colors. Very pretty cards. Love your colors! The bright intense colors on these cards, done with the new stamps, is awesome. I like seeing the teacup used as a vase. It’s wonderful to see how the different women using the same stamps can make the cards look different just by the colors & techniques that they chose. Both of your cards are absolutely stunning, Svitlana! The Vintage Tea Cup looks like a beautiful English Bone China cup I have in my Dining Room Hutch 🙂 Love the sewing project card too! This is gorgeous! Love the tea card especially! Beautiful cards! 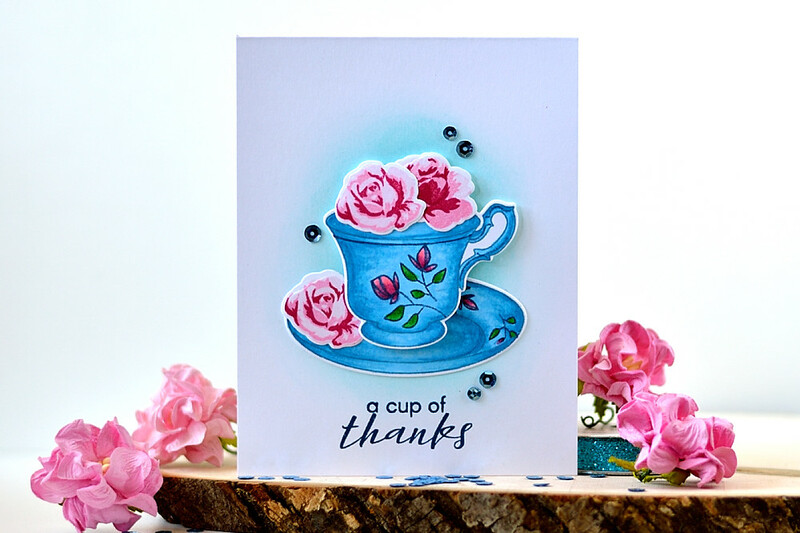 I love the tea cup card with those gorgeous blooms! Your teacup card is gorgeous but your sewing card just captured me! I adore the sewing card and now I want that set!! 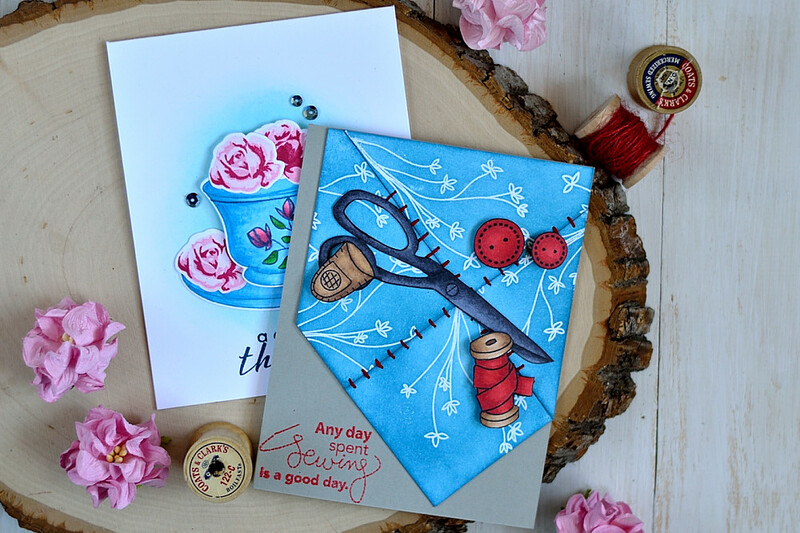 Beautiful cards – love the sewing one especially! Beautiful cards. I love the vintage roses in the tea cup. And the sewing card is so cute. Perfect for my Mom. Gorgeous cards. I love the colors and the designs of both. Especially love the first since I love sewing. WoW! Where to even begin complimenting these stunning cards!. 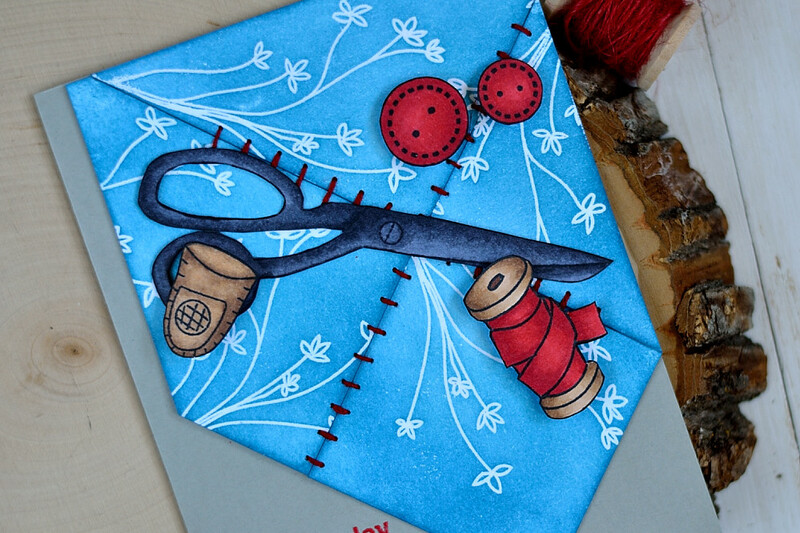 The stitching and scissors card, just comes to life! Both of your cards are so pretty! Love this new release. Beautiful cards! Love the vintage tea cups. These tea cups are crying out to be teamed up with pretty floral images, which Altenew do so well. Thanks for sharing these two beautiful cards with us! Gorgeous cards!! Such lovely color using wonderful stamp sets!! I envy your immense talent. The sewing card is my favorite because it was a huge part of my life at one time. I don’t have nearly enough time for it anymore, but it’s always nice to see reminders of those fun days. The roses in the vintage tea cup was a wonderful addition and just the perfect touch. Your cards just pop with all the color. Great job! Two magnificent cards!!! Completely different in feeling. The way you made your sewing card is such a great idea! Your tea cup card is beautiful! Your colors are so bold & beautiful! Wow gorgeous cards! Love the patchwork one!! Beautiful cards:) I am in love with the tea cups filled with pink roses. How lovely! The sewing card is very nostalgic for me as it reminds me of my dear grandmothers, both of whom, sewed by hand. I had some special dolls clothes as a child thank to them both. Sweet memories! Wow!! Both cards are stunning!! Love the colors! The teacup with roses is so beautiful!! such a beautiful vintage tea cup card! 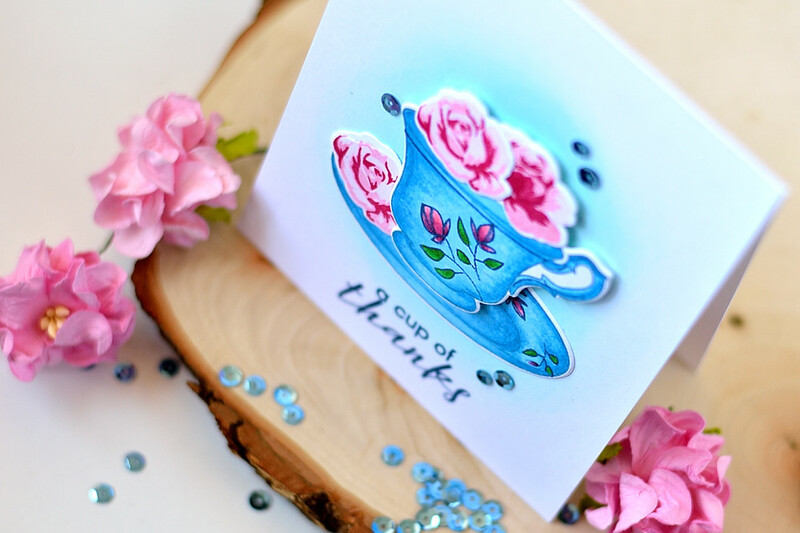 Such a fun sewing card and absolutely stunning colors on your teacup card!! Your cards are pretty, love the strong bold colors. Love your work. I love the colors that you used on both cards. It was also nice to see the sewing set used on this blog hop! I really like the asymmetric design of the sewing card and stamping the sentiment on the bottom layer adds a nice element to the design. So much fun!! I was so happy to see the sewing set used, you have really made it shine! LOVE your flower filled teacup, LOVE your pretty patchwork too, BOTH are WONDERFUL designs and the colours & colouring FABULOUS!!! The Vintage Teacup set was already on my wishlist, now I realise that Sew Very Happy is SO VERY LOVELY and a MUST HAVE too!!! THANK YOU for sharing, INSPIRING … and tempting me!!! Wonderful cards ! I love the patchwork card with the real stitching and the cups holding the beautiful roses. Thanks for sharing your creativity with us! You’re amazing! I love the way you used the products and your designs. Gorgeous quilted look on the first card. The teacup is very pretty. How pretty! Love the blues! Both of your cards are beautiful! I’m especially glad to see a card made with the new sewing set. Your card you created with it is wonderful! I love the colors and the design! So Beautiful and so inspiring Cards! so lovely, I love the colours and design. Sew gorgeous! Stunning layout and coloring. TFS. Gorgeous! Gorgeous! Gorgeous! I especially love the tea-cup card! I collect everything tea cup! This is especially beautiful with the lovely flowers added to it! Sensational! The Sewing card is wonderfully detailed! I love the actual sewing on it! The dots on the buttons are a part that makes this card work so well. It’s your attention to details that make these cards outstanding! Thank you for having such a great Give-Away! And, Congratulations to Altenew for such a successful Stamp Release! I am in love with all of the stamps! Thank you for the very generous Give-Away! Absolutely ecstatic to be a winner and, especially, from YOUR blog! Thank you ever so much! Sending my email shortly and then going shopping!! !